SKK Lynx S LTE Mini, The Most Affordable LTE Phone In Town At 2399 Pesos Only! Home / mobile / news / skk / SKK Lynx S LTE Mini, The Most Affordable LTE Phone In Town At 2399 Pesos Only! According to recent flyer leaks, there's another LTE device from SKK Mobile called the Lynx S LTE Mini. Solid specs for the price! The Lynx S LTE Mini is the baby brother of the Lynx S LTE that features a 4 inch IPS WVGA screen, an unknown type of 1.5 GHz yqad core processor, 1 GB RAM, 8 GB expandable ROM and 2,000 mAh of battery. To make things sweeter this handset is loaded with Android 5.1 Lollipop, 5 MP rear camera with flash and 2 Mp selfie camera. 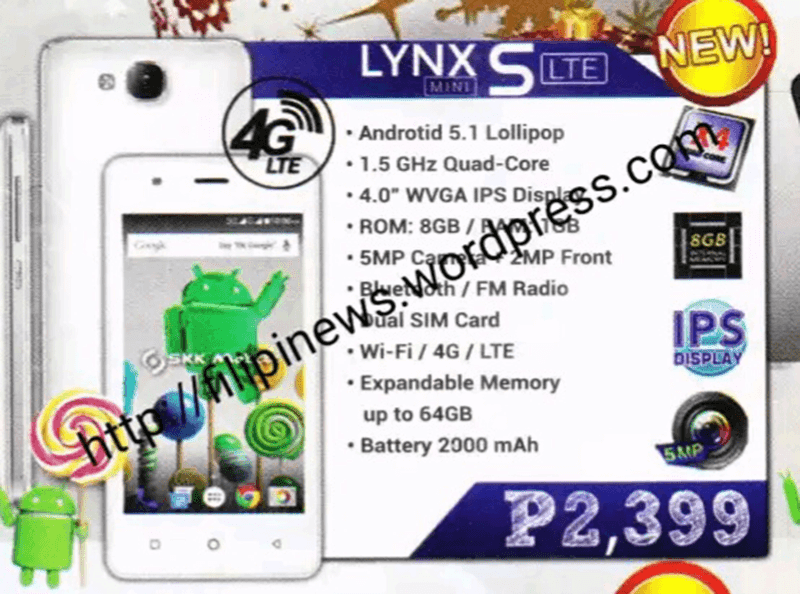 If this information is correct, SKK Lynx S LTE Mini which is priced at 2,399 Pesos only, is the most affordable LTE handset in town beating CloudFone GEO LTE for that crown.